Some bloggers really put in a lot of research to compile their blog posts while others are not writing about anything that requires much research. If you're spewing out facts and figures and want to be recognized for your accuracy then it's a good idea to do thorough research so you don't end up getting disputed and being made look like a less than credible blogger. If you want to add links to support your claims or to provide further exploration on a topic it will take some time in order to assemble them all to add to your post. Most bloggers do their research on the internet, but as in any writing that is backed by research it's wise to carefully check your source material against other sources. Beware the internet sources however as many of them are merely duplicated from site to site. The internet can be a treasure trove of useful information at times, but at others the internet spreads lies and faulty information that unfortunately starts getting accepted as truth. Where do you usually go to fact check suspect information that you find online? What is the craziest non-truth that you've found on the internet that was being touted as fact? How much research do you usually do for your average blog post? "R" also stands for "Release Day" we see many of these on blogs. Today I want to mention Nicki Elson's new release of Vibrizzio. Sounds like a steamy one so I'll let you visit Nicki's site for more info or you can check it out on Amazon! Well everything has a good and bad side and so does the internet. One just has to be smart about how to use it. So true, but there is a lot of misinformation perpetuated on the internet until it starts becoming stated as fact. Hi Lee - I'm fairly careful in what I use - I'm really adding to my base of knowledge and recognise when something doesn't ring true - and in fact don't go to sites unless I'm really sure about their subject. Your posts always seem very well researched and I have little doubt in the veracity of what you post. Sounds like solid resources to me. I have my key movie and music sites I check. Since most of your stuff is pretty current I'd say those sources are good ones that can be trusted. I love doing research. I think it is linked to why I like writing fiction - one life isn't enough for me and writing about others fully - including researching places, jobs, psyches etc...- is one way to live several lives. My biggest check on research is my fella - he is a polymath with so much accurate information stored in his brain pan that I throw him stuff all the time - is this true do you think? I'll ask him. And he'll tell me. If he doesn't know then I try and find a local real person who is an expert on whatever I'm researching. Sometimes I'll go to others who I think will have the answer I need. I agree that research can be fun to the point where sometimes I get lost in it. Some really good advice here. Sometimes, I do "research", but I don't always check the source of the "facts" that I used. Will think about this differently from now on. For some things it might not matter too much, but best to be accurate lest some knowing reader call you on what you've written. Wikipedia is my go-to when I'm posting facts on my blog. I see a lot of idiotic stories that people take as fact posted to Facebook so I end up having to research them to see if they are true. In that regard, Snopes becomes my go-to for disproving stuff. I will often refer to Snopes as well as other sites. So often I'll get crazy emails that I have to check to see whether what has been stated is true at all. Usually it's urban legend or the like. I usually let things like that pass unless it's something dear to me or that I think is important to be corrected. Research is very important especially if writing a novel. Great topic Lee, a pleasure to read. Some poetry even could involve research, but probably not very often. Hi, Arlee! My blog revolves around favorite music and memories of my youth. Decades ago, long before blogs came about, I had the foresight to make a list of the most important recordings that were popular at my notorious hangout, the Shady Dell, and get memories of my mid 60s experiences written down before they faded. Today I draw upon those reliable sources for post material and don't need to rely as heavily on the internet as I would have otherwise. When I use the internet to look up the words to old songs I am shocked to find so many errors on song lyric sites. Site after site repeats the same mistakes. Most of the research I do as a blogger happens when I visit other blogs and do some additional reading and fact checking before leaving a comment. I wanted to tell you again, Arlee, that Margaret and Kathleen Schneider deeply appreciated your comment on my blog. Yesterday, Kathleen finally had time to write you a reply. I hope you get a chance to read it. I did read the reply from Margaret and Kathleen and was very pleased. They had a wonderful response from your readers. CONGRATS to Nicki! ALL THE BEST! Michael, Wikipedia gets flak for what they do, but I think for the most part the articles there are fairly accurate. They have too many eyes on them ready to make corrections. I often start at Wikipedia to get enough information to Google for other sites to verify what I've read there (Wiki rarely lets me down). My blog posts aren't research intensive, but if I say something there, I do hunt around for back up that what I say is true. I wish you well with the book. I guess you're getting some buzz today and shaking up the blogosphere. Your topic would require a lot of research I'm sure. Your blog provides some outstanding information that I take as very authoritative. Great content at your site. I spend a lot of time researching on the internet, but in the end I go back to the tried and true books. Now depending on the project depends on how deep I need to go. My recent WIP (and now in the hands of my editor! yea!) I needed the scientific names of a lot of animals. Wikipedia is good enough for that. For my current blog theme of vampires I am going to a lot of books in my own library. Books somehow seem to have more credibility than a lot of websites. Although my blog is mostly me ranting about little things that annoy me, there is often times I need to research. For the most part, it's a particular word. When possible, I try to go right to the source. An official blog, if I'm talking about someone in particular, or if I'm ranting about some food product, right to their website. For real general information I'll use Wikapedea, though I realize not everything is correct on there. It's mostly used for research that is not very important. I.E. the title of a TV show or something like that. Wikipedia has some excellent articles where there have been highly credible contributors, but it's not always guaranteed as solid. Using the sites closest to facts are the best, but it's good to compare information as well. I like to include at least one link in every post. Sometimes I have some research and sometimes I'm just sharing my personal opinion. Bloggers share a lot of opinions, but I don't mind that as much as the news being injected with personal opinions. I do a lot of research for my fact-heavy posts, like my past series on diseases and historical fiction, and my A to Z posts this year and last year. It's very annoying to see urban legends being promoted as true. That just makes it harder to debunk these stories all over again for the umpteenth time. It's so frustrating to read yet ANOTHER person claiming s/he went to school with the Jello twins, or insisting "Ring Around the Rosie" is about the Black Plague. I know you do a lot of research for your posts. Even though my A-Z has four lines of poetry to go with each photo, I did background in case commentors had questions on insulation, or building a shop table, for example. Lot of fun! I've always thought you should add in depth footnotes to your poetic offerings to show your scholastic source materials. For the most part, I write mainly about what's taking place in my life so no need to reasearch. Sometimes I will do some research about peripheral things in the world when talking about events in my past. As odd as it may sound bearing in mind the nature of my blog I do actually do research because I like to have links. OK folk seldom notice them but they are often there just under the surface of my little yarns. Take today's R post it has a little fact (OK a rather well known one) tucked away in the story, although sometimes they can be very obscure and I do wonder what makes me do it as its just extra work for me. I wonder how many people really check links? We bloggers could probably just say any old thing. I basically don't need research for my blog other than for a strange ingredient. If I am searching I use Google but as far as I know I have never been misinformed but I might be perpetuating misinformation unknowingly. Most of that information you research probably has little controversy attached so that there is no reason for agenda driven fact manipulation. I have so many sites bookmarked for publishing and promoting research it scares me. I bookmark sites then forget they are there. For reasons you stated, I always check multiple sites - on the same subject, just to be sure. And yes, I tend to get lost in research too, sometimes it's so fascinating! Some of the discrepancies can get frustrating. It's amazing how much crazy misinformation people put on line. The craziest non-truth floating around, right now? That there is no climate change. I experience climate change every year. Sometimes it happens each day. I should probably cite my sources more often than I do, but be assured that I do use research if I'm dealing with something that requires more than just my knowledge. I try to avoid anything that conflicts with my own opinion. I'm getting better about checking sources of emails and Facebook postings as they can be notorious for misinformation. I don't do a whole lot of research on my blog. :( For me, my blog is about writing daily. While I try to make sure what I share is accurate, I always (at the very least) mention my sources implying that what I've said may not be accurate. We can always put the blame on someone else--that can work if we're not trying to be scholarly or anything like that. 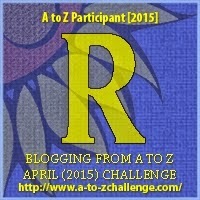 One thing A to Z has done for me is changing what I post. I am moving more to a review of books, movies, plays or local information or history. So research will be on the menu for me. I guess that sounds like a positive recommendation for the A to Z Challenge. I do a fair amount of research, depending on the subject matter. Wikipedia, Newspapers, reputable music, historical and medical sites, mostly. If something sounds suspect, I'll check Snopes and Hoax Slayer. I get all most of my research from my books. I notice that some books give different birth dates so I check and re-check and use the one that seems the best. I also just know many of the info in my head but double check by looking through my books and then will go on the internet to make sure it appears aok. So many sources, so much discrepancy! I don't usually believe everything I read on the internet. I rarely do any research for my posts either, as I'm more of a personal blogger. For this month's series on blogging tips though, I am doing quite some research, but, I like to cross-check from other sources as well. There are a lot of good reasons not to believe everything we read on the internet and other sources as well. We've got to watch that commonality of facts. Usually it's pretty clear though if it just cut and pasted material. I don't do a lot of research for my blog, but I am doing research for my latest novel. My protagonist gets caught up in the Madoff scandal (unwittingly). Though the scandal itself is less important than its impact on her life, I want to get the facts right. For this, I'm using online news sites such as the New York Times combined with various books about the scandal and about hostile takeovers (another subplot). When I've read a period novel that is off on the facts it makes me cringe. I want to believe everything if it's based on real times, places, and people. I can see where you had to do a lot of research for your A to Z theme this year. Those posts must have taken you a lot of time, but that would be fun research. Proper research is vital! Excellent post.